So, have you been bitten by the mug rug bug yet? Since I first posted about mug rugs a few months back, I am now able to type out the full name without giggling like a grade schooler. I've also participated in a few mug rug swaps that I heard about over on Twitter. 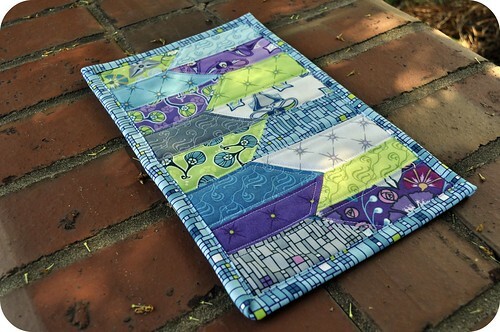 First, I joined the Mug Rug Madness swap where I received this adorable little mat from Alissa (alissadumont). So simple in its design, yet so effective with its color combination, its adorable prints, and its white binding -- seriously, I would NEVER think to do that! 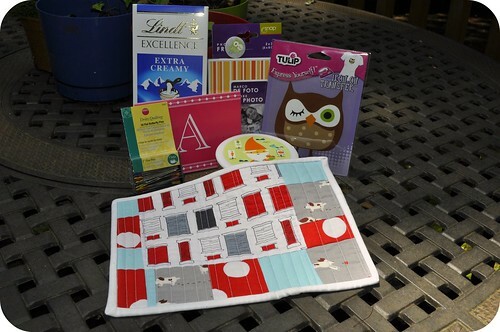 And Alissa really spoiled me with all of the goodies that she included with the mug rug. I haven't participated in an all-out swap like this in a while, so it was fun to both send and receive a package filled with fun extras. 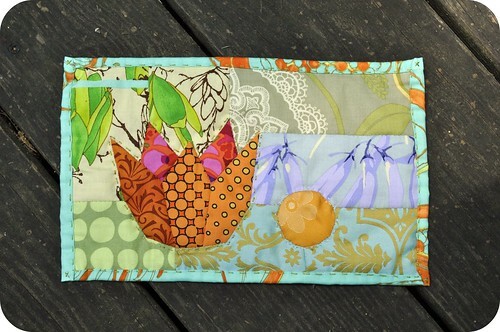 Then, Jacqueline (who blogs at Handmade with Love) started a Muggy Ruggy Swap on her blog and I couldn't help but jump in. I was extremely lucky to receive this beauty from Hilde Klatt, who blogs at Ildicolor. 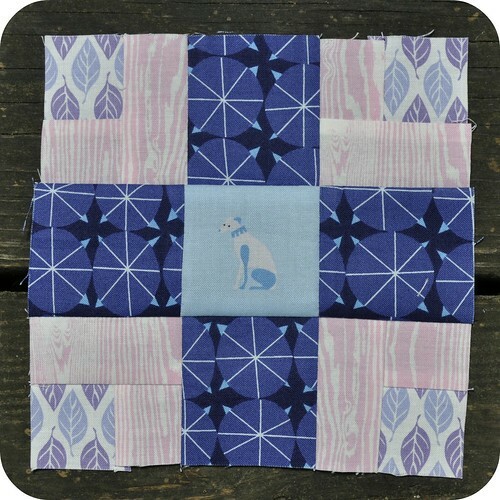 Hilde is a new-to-me quilter, and her work is just amazing. Even more amazing was the thoughtful package she sent that included some extra special gifts. See those cute little mouse ribbons? Hilde sent one for each of my children! Oh, and I guess I should show what I sent in return. 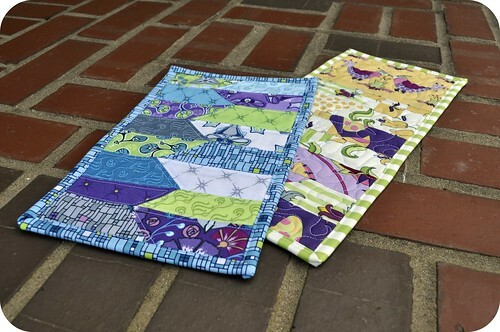 Here are my two mug rugs, both variations on the same pattern. For the Muggy Ruggy Swap, I sent this guy to the swap organizer herself, Jacqueline. I used one of my favorite new lines, From Little Things by Sarah Fielke, and featured some of Sarah's little partridges up top. 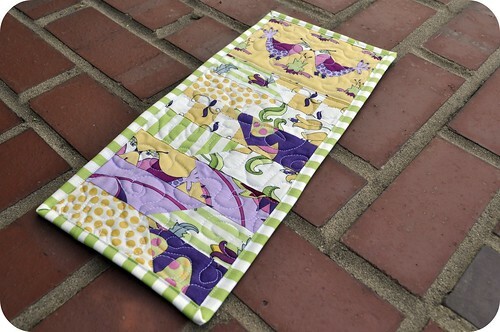 It's kind of long for a mug rug, I guess ... though I prefer to think of it as just some more room for cookies. 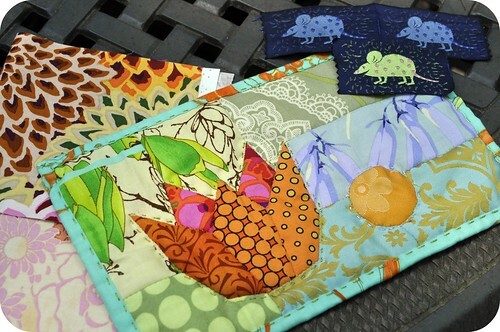 And here's the one I sent to Amy (needled.fig) for the Mug Rug Madness Swap. I made this one from Jessica Levitt's fantastic new line, Kingdom. And the pattern? 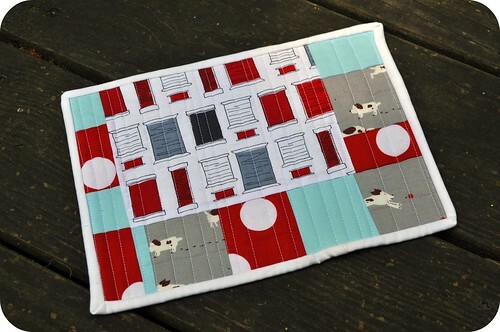 I called it the Ziggity Mug Rug and wrote it up for a little guest post over on the Sew Mama Sew blog. If you make a Ziggity Mug Rug, I'd love to see it! I don't usually venture into circular territory, but the do. Good Stitches quilting bee has been pushing me into somewhat uncomfortable territory the past few months. And I think that's a good thing. I made these 5 striped circle blocks to help Angela realize her vision for her charity quilt. I followed her tutorial which (quite cleverly) results in these CD-sized blocks having the sticky side of some fusible interfacing exposed on the back. Angela's going to fuse all of these circles onto a solid background for a fabulous quilt inspired by Kristen's. 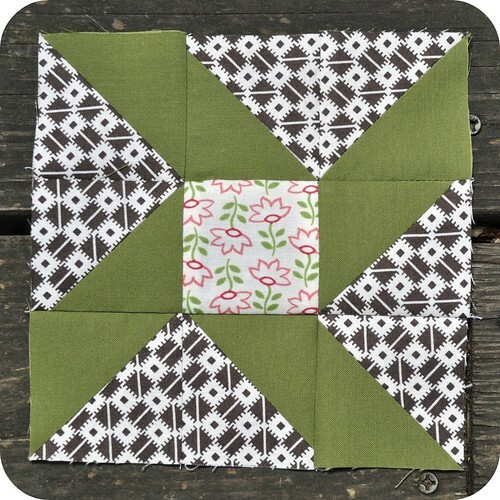 May was the kick-off month in the Bee Tweet bee, and Erin asked us for colorful scrappy blocks in kind of a 5-sided log cabin style (loosely based on Aneela's block tutorial). 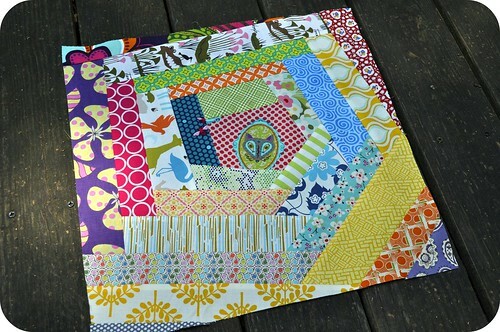 I had a lot of fun playing with some of my favorite scraps here without too much thought of matching or coordinating. This block finished out HUGE -- about 17.5" square -- and I'm so excited to see how Erin's quilt turns out. 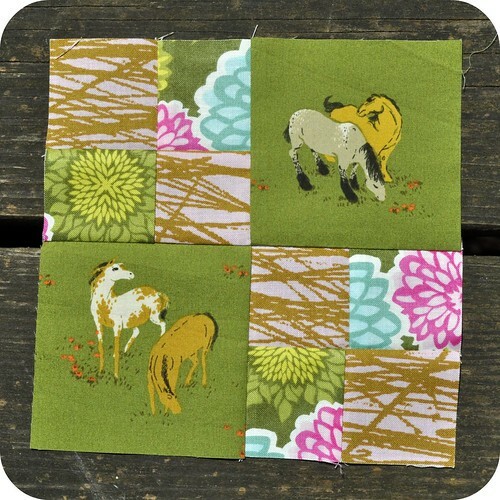 I expect someone will ask, so I hunted down a link to the fox fabric that I used in the center of my block here. It's called "Flora Fox" from Farbenmix, and I got mine as a present from the ever-fabulous Katy. There's a big giveaway of Anna Maria Horner's new line, LouLouThi, over on the Fat Quarterly blog today. 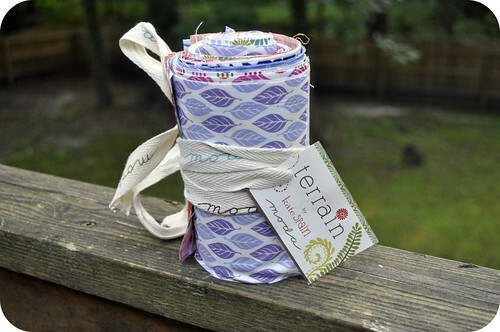 Are you coveting this fabric as much as I am?? Be sure to jump over and enter, and BIG THANKS to Kimberly and her team at the Fat Quarter Shop for sponsoring this fantastic giveaway. See you over on the Fat Quarterly blog! OK, so by now I totally embrace the fact that I'm a little bit crazy. The latest bit of proof? 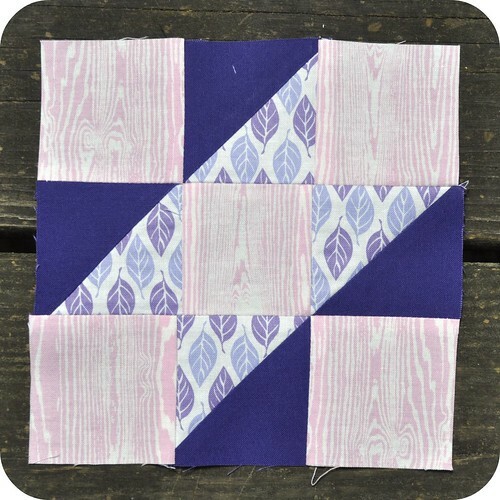 I decided to jump in to the Farmer's Wife Quilt-Along, being hosted by Amanda and Angela. 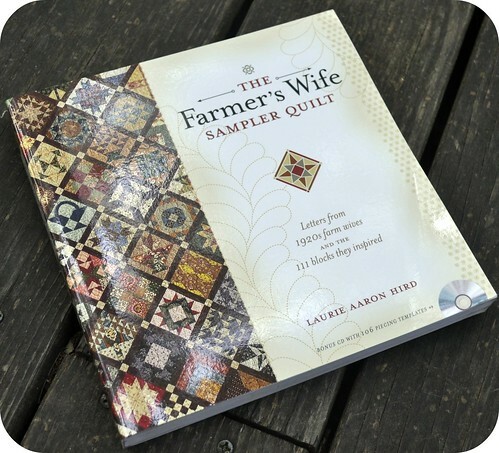 The Farmer's Wife Sampler Quilt is the basis of a book by Laurie Aaron Hird that features 111 6" block patterns. Every block is made by templates, which are found on the CD in the back of the book. You can check out Laurie's website to learn more. I really wanted to jump in to the project because I am always so inspired by Amanda and Angela and the beautiful things they make, so I thought it would be fun to join them -- and a bunch of other Twitter buddies -- in this long-term project. The plan is to make 2 blocks per week, encouraged by all of the other quilt-along members. The sampler quilt in the book is made from more traditional fabrics in muted tones, but I wanted to put a more contemporary spin on the quilt. 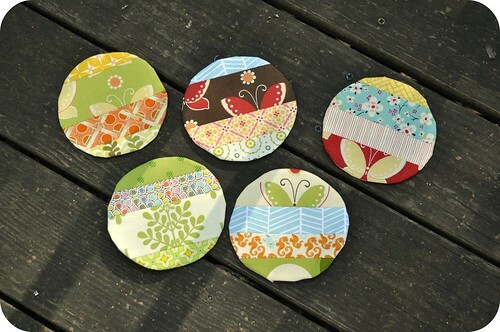 I was lucky enough to get a FQ bundle of Terrain, Kate Spain's upcoming new line for Moda, at Quilt Market last month. (Thanks, Katy, for braving sample spree for me!) I decided to use these amazing colors and prints as the jumping off point for my blocks -- not sticking to this line exclusively, but including at least a bit of the line in each block. I was so eager to get started this weekend that I made 4 blocks. No, I'm not an overachiever -- I just know that the next few weeks are going to be crazy here in the Quilt Dad household so I thought I'd get a bit ahead while I can. I'm having a great time already with these blocks, and it'll be fascinating to see how everything starts coming together over the next year. Want to join us in the quilt-along? It would be great to do this along with all of you! Be sure to join the Flickr group, and leave me a comment if you decide to jump in. I'd love to see your blocks!